2. Natura Bisse Stabilizing Cleansing Mask: A deeply purifying mask with 2 percent salicylic acid, tea tree and rosemary. Detoxifying and invigorating at the same time! Best for skin that is breaking out or in need of aggressive care! 3. 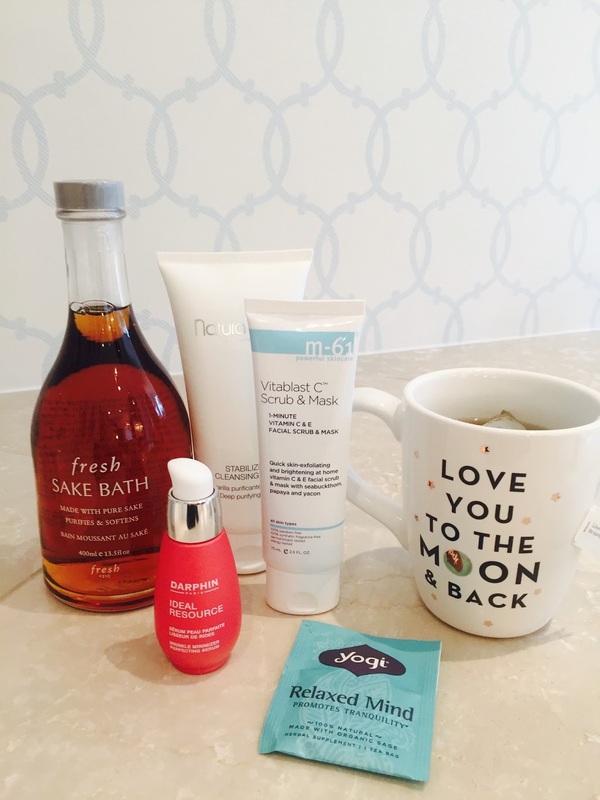 M-61 Skincare Vitablast C Scrub and Mask: I created this quick multitasking scrub/mask combo for quick brightening and hydration. Packed with vitamin C, papaya enzymes and gallic acid, you scrub it on your skin for 1 minute, then rinse off. This one is more gentle than the Natura Bisse mask and is great for normal-to-dry skin. It's instant luminosity! 4. Darphin Ideal Resource Wrinkle Minimizer Perfecting Serum: This radiance-boosting, line-minimizing serum is perfect post-mask, post-bath and pre-nap! Clary sage is antibacterial and calming - the perfect end to an unplugged moment! 5. Yogi Relaxed Mind Tea: My new favorite - this one puts me right to sleep with lavender and organic sage.